No oops, but we did it again. Add another award winning design and implementation for the category of Overall Website in the CASE VIII 2012 Communication Awards. Oregon State University proudly brought home the Silver for the OSU College of Public Health and Human Sciences Website. If you don’t know by now the work of Web Communications and Central Web Services, you should. For the Central Web Services team of Sher Fenn, Paul Lieberman and Mauricio Cordoba, congratulations! Congratulations to Web Communications and CPHHS team members. It was a truly a team effort and another win-win-win for OSU in its collaborative efforts. This could not have happened by any of us individually and reflects what comes from working together. 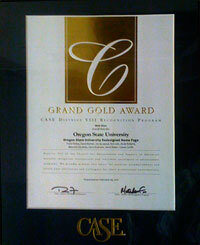 CASE awards only one Grand Gold certificate in each category. If you haven’t read the Web Communications’s blog, then you might not know that Oregon State University took home an award in the 2011 Communications Awards during the CASE VIII Conference. CASE is the Council for Advancement and Support of Education, and is broken into regions in the US. CASE VIII represents the Pacific Northwest and Western Canada and has 130 member institutions, one of which is Oregon State University. The Communications Awards have various categories for awards. The Grand Gold is selected as the best overall entry in the category. So who received the Best Overall Web Site? Well, as you may have guessed by now, it was OSU. The Grand Gold is a great achievement for all those involved, which took a very collaborative effort with individuals on campus. For Central Web Services, it does more than just recognize our development effort that went into producing the page with it’s dynamic capabilities, and multi-user control. It does more than recognize how software development MUST be linked to marketing as well as the partnership between the Web Communications group and Central Web Services. For myself, and CWS, it also recognizes the software life cycle put in place for the Home Page to ensure ongoing continuity. People may not judge a book by its cover, but people do judge a University by its website. Version 1.0.0 of the Homepage was released in May of 2010. We are now at 1.2.4 and moving forward, anticipating a possible 1.3.0 and more definite version 2.0.0 this year. For a full list of awards, you can read the awards book PDF found on the CASE website. Congratulations also go out to Extension for its OSU Campus Tree Tour Guide and Reference iPhone app, which was awarded a Silver. Posted in OSU Home Page.